Datuk Seri Anwar Ibrahim arrived at Dewan Besar, Utusan Melayu (M) Berhad as guest of honour for the Presentation of Literature Award 2018. Kuala Lumpur 27 Feb: Datuk Seri Anwar Ibrahim who is also the President of PKR came to Utusan Melayu (M) Berhad today as a guest of honour to the prestigious Presentation of Literature Award 2018 Ceremony. 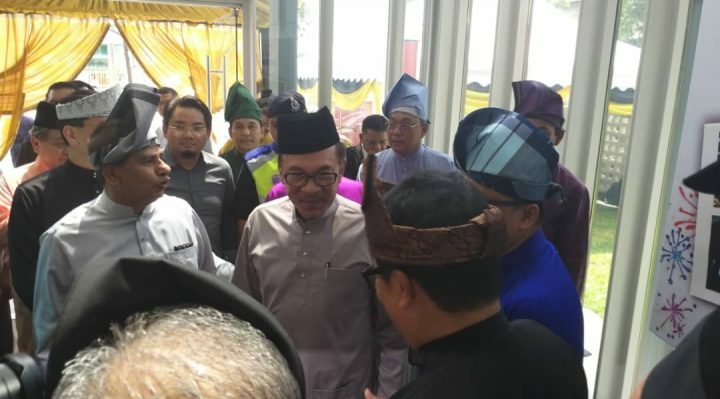 His arrival was received by staff of Utusan Melayu group and 1,000 guests including prominent writers, novelists, catoonists and creative artists. Earlier in his speech he said many of his supporters and PKR leaders have expressed their worries of him accepting Utusan’ invitation to the event. He said Utusan does not belong to UMNO now and the event is not politically motivated but a social, educational and of humanitarian values. The last time Anwar came to this event as the guest of honour was in 1994 when he was the then Deputy Prime Minister. This 33rd Literature Award organised by Utusan Melayu Group is an annual event that recognises the works of creative people contributing to the enrichment of Malaysian literature and cultures.